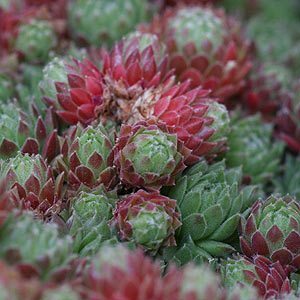 Sempervivum are commonly called, Hen and Chicks or House Leeks, these are drought tolerant succulents that can look great in a rockery or a pot. Probably one of the easiest to grow of all of the succulents. A genus of over 40 species that grow to form low growing attractive rosette like patterns. The big rosettes are the ‘hens’, and the smaller ones, or offsets that form around them are the ‘chicks’. The larger rosettes the ‘hens’ will flower and then die, but you simply replace them with the ‘chicks’. S. tectorum , the the common houseleek. S. arachnoideum the ‘Cobweb Houseleek’. All varieties prefer a well drained soil, a gritty potting mix designed for succulents is best. Full sun is best for good growth, a good soaking every 2-3 weeks is enough watering. We suggest using a specialist cactus and succulent potting mix for best results. They are suitable for growing in containers or pots, especially the smaller species. Full sun and a well drained soil. The only real problem is overwatering, so a free draining soil or potting mix is essential. 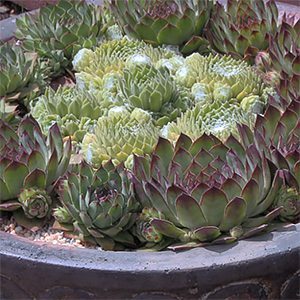 Sempervivum or Hens and Chicks will produce chicks (see left) during the growing season, and this is the easiest method of propagation. The Chicks can be left or removed reduce crowding or to start a new colony. 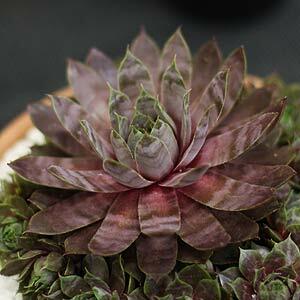 Sempervivum take fairly easily so propagating should be simple. When propagating , it is best to place the chicks in a cool shady area for 4 -5 days in a good succulent potting mix, water once and then water again once the potting medium dries out. Remember that the Hens will die after flowering. If the lower leaves are turning a little translucent, or even worse showing signs of rot, you are over watering. All varieties need good drainage and the root systems do not like prolonged soaking in cold water. This combination leads to root rot. To try to solve this, remove them from the potting mix and replant in a dryish free draining medium. If the leaves are looking scorched, then they are sunburned. Move the plats to a position in morning sun and afternoon shade. If the leaves are starting to turn downwards, it can be a sign of lack of light. Elongated foliage can also be sign of lack of light.